Hey ! Has everyone entered our Sally Hansen giveaway yet? If not enter by clicking HERE !! :D Good luck ..
Today's post is about 2 Sally Hansen Hard as Nails Xtreme Wear Jazzy Jade & Sea-ing Stars. I love love the colours. So despite my ragged cuticles (with work I don't know when I can repair them!) there's a ton of pictures below!! Prepare yourself after the jump! First, it's a bit too blue to be called Jade for me, it's more of a blue teal. I still really like the colours though. I am very happy with this release. Aside from purple, these type of shades are my favourites. Due to the shimmer it does have a bit of a streaky finish but it's hardly noticeable. Coverage was also pretty good, 2 coats for opacity. Dry time is average and it lasted about 2 days before some slight tip wear. At first, I thought it *might* be an opaque-ish jelly to be worn on its own, and although you technically can I wouldn't recommend it. It's more of a glitter topper even though it's tinted teal. The base is practically clear and the glitters itself are opalescent. So for swatching purposes I did it as an accent nail. It hardly shows unless angled under the proper lighting but it does a good job hiding the streaks of Jazzy Jade. Off the top of my head, other than it's own dupe, I would think Julep's Portia is one also..or at least super similar. shows colour the best despite blurriness. this shot shows the glitter the best.. usually it's almost naked. Funny enough, although this is a new release, it's only a shade different from one of the previous Xtreme Wear's Teal-y Cool, which Annie has. Since the base is practically clear and the glitters are opalescent I can't really tell the polish is different when swatched. 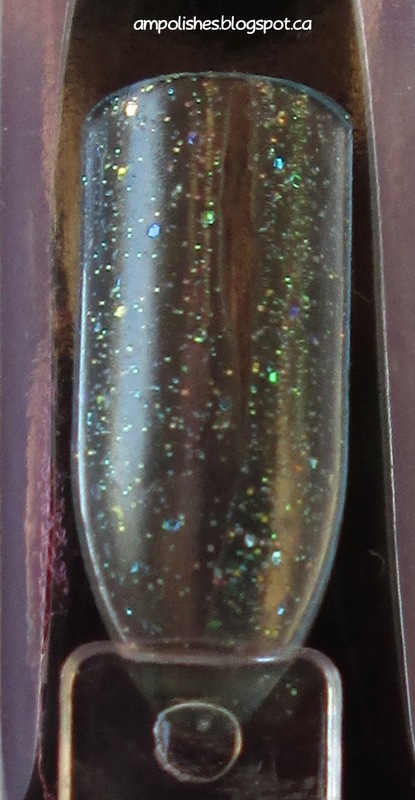 Sea-ing Stars is slightly more dense in glitter coverage but aside from that, the only difference can be seen in the bottle. So, if you have Teal-y Cool from before, pass on this and get another new release! same brush, just different colours. After 2 days, I started getting tip-wear (most noticeable on my middle finger). It was inevitable due to my job but I originally thought it would only last 1 day hahaha.. After the 2nd day, I decided to coat it with Sally Hansen's Work Of Tart Sugar Shimmer. It is slightly blue-r than Jazzy Jade but has a wonderful golden shimmer which shone slightly. Annie reviewed it HERE. Hard as Nails Xtreme wear are 11.8 ml / 0.40 fl oz. These polishes should be popping up at a drugstore / store near you soon if they haven't already! For more information, visit Sally Hansen here. Check out their Facebook here. Beautiful colour...looks great on you! I really like how detailed your review and swatches are. Thanks for the info! aw :( there are some which I found a bit sheer but I really liked these two! Hope you find something you like soon.